A Place to Bury Strangers' Oliver Ackermann has said he aims to take listeners' minds on a trip with his music, and the band's live show does just that. It's an immersive, mind-melting, eardrum-maiming, gelatinous wall of sound experience, the band shredding their strings, destroying their drums and stomping all over those nifty Death By Audio pedals engineered by Ackermann himself. APTBS were shadows on the stage, ghosts obscured by heavy smoke and oscillating light streams, the vague stick figure of Ackermann lurching like some mad fiend. At the end of some tracks, the lights would illuminate the stage in a brief moment of clarity, living beings giving it their all, band members' faces streaked with sweat. But ABTBS don't want to distract you with appearances; they want you to lose yourself in a their noise experience. The screeching solos and nearly constant feedback were a violent assault delivered with love for noise junkies in the audience, though some were unable to hide the discomfort on their faces amidst wince-worthy moments. Tracks often started out indistinguishable, but this wasn't the result of an inept sound guy (APTBS are known for bringing their own) — rather, it was the desired effect. They started out with an almost unrecognizable, squealing take on "We've Come So Far" that set the pace for the rest of the night. They almost exclusively played tracks from their last two albums — mostly the more subdued, straightforward ones, like "Fill the Void" and "Worship," which were amped up to sound fuller. For long-time fans, the set list disappointed slightly. One of the only songs off their first two albums (their strongest to date) was "I Lived My Life to Stand in the Shadow of Your Heart," on which suspenseful scratches pierced the air like lightening. Destructive force was employed almost to perfection before falling short of the super bassy fuzz effect on the album. Still, the band playing this track to completion — instead of opting for a mid-floor DJ set by Ackermann, as happened at the band's last Toronto show at NXNE — was a relief. The band did, however, close with some electro-clash noise experiments that were a bit more interesting than last time. Unhinged vocals and erratic free-form beats morphed into a moment of industrial-jungle, Pretty Hate Machine vibe at one point, and an aggressive shrapnel effect broke into noise for noise's sake at another. Ackermann's return to this DJ approach suggests experimental noise-rave might be the direction in which APTBS is headed. Feeling the way APTBS's dark and dangerous sound bounces around a room is surreal, harsh and unique. They annihilate the senses with their brand of combustive noise, inflected with industrial tinges. 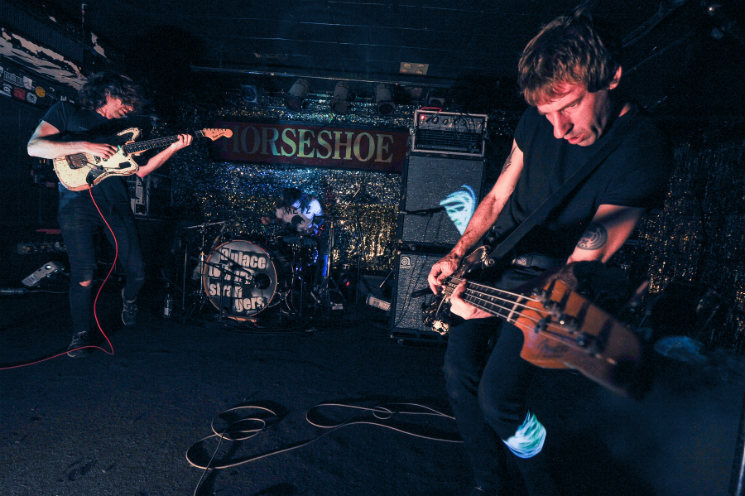 The big misfortune is that the shoe-gaze and post-punk elements are drowned in the sea of noise live, but still, A Place to Bury Strangers' shows stick with you long after the 75-minute performance ends, earning them a spot as a do-not-miss band for all future dates in your hometown.